Premium Manchester City players are top of the captaincy picks for DOUBLE Gameweek 25 – but will it be Aguero, Sane or Sterling? If you went to a fast food chain only to be informed by a staff member that all their burgers, chips, pizza and fizzy drinks were out of stock, leaving only apple slices and bottled water, that would be the FPL equivalent of double gameweek (DGW) 25. That’s probably a (weird) hyperbolic comparison, but rotation-heavy Man City and out-of-sorts Everton aren’t the ideal pair for double fixtures this week. Your attacking Man City assets could feasibly start just once, and Everton now only have just two remotely exciting assets – Richarlison and Gylfi Sigurdsson – in light of Lucas Digne’s suspension against Wolves. Plus, bearing in mind that both City and Everton will blank in GW27, it will take bravery and/or stupidity to stock up on four or more City/Everton assets this week, unless you have an Alcatraz-esque escape plan lined up. The fact that Man City are Man City necessitates at least two entries from the champions in this week’s captains list, but if you look beyond the double fixtures, there’s decidedly good value to be had in the single fixtures. It’s bizarre to make an argument for and against captaining a player based on forces beyond his control, but that’s kind of the case with Sane. Prior to City’s 2-1 reverse at Newcastle, the mercurial German had been rested for City’s two previous games across an eight-day period. That he was removed from St James’ Park on 73 minutes suggests his heavy involvement in DGW25. Of course, the booming smile of Benjamin Mendy hangs over Sane’s DGW prospects. The Frenchman made his return following two months out against Burton last week, but was subsequently rested from both City’s FA Cup squad vs. Burnley and vs. Newcastle. Pep Guardiola will likely be pithy at best on Friday when detailing Mendy’s injury stance prior to DGW25, but it is likely Mendy could be involved in one if not both games, albeit two starts appears unlikely. There is of course the debate of ‘will Mendy’s return tangibly affect Sane’s output?’ This excellent thread from @FPL_Col analyses their minutes played and attacking returns, and while Sane’s minutes are fewer when Mendy plays, his impact is still significant alongside his team-mate. Sane has scored or assisted every 69 minutes this season, the best returns-per-minute in the league, and prior to GW24 Sane had registered an average of 10 points in each of his last three games. Ultimately, Sane is City’s form player, and Guardiola will want his strongest teams out in both DGW25 fixtures as they bid to usurp Liverpool’s title bid. Let me first just say, this slot could easily have been given to Raheem Sterling. Sterling has three assists and a goal in his last five, and has played 90 minutes in City’s last six games. To observe another stat though, Sterling has scored more than six points just once in his last nine games. His point-scoring form is steady, if not explosive. Sterling, Sane and Aguero are all in the same predicament of potentially being benched for one game in DGW25. Aguero gets the nod here having scored in his last three in all competitions. Aguero’s chief DGW threat is of course Gabriel Jesus. The Brazilian dropped to the bench against Newcastle following an excellent run of eight goals this month, leaving Aguero to fire in City’s only goal at St James’ Park, but competition for minutes will inevitably affect both in Double Gameweek 25. The money question is of course ‘will either striker start both games?’ I would personally wager Aguero leads the line once more against Arsenal then drops to the bench vs. Everton – an ostensibly easier fixture where Pep would prefer resting the Argentine. That’s not to say that Aguero won’t feature against the Toffees though. Using this logic (which of course could be proved wrong by Pep starting Aguero twice, or heaven forbid Jesus twice), you’re likely captaining Aguero based on one fixture and hoping for a cameo return in game two. But this is Aguero; that’s not the worst captaincy position to be in. Aguero has scored or assisted in each of his last five league starts. He has the fourth-highest xG (11.44) despite playing 400+ minutes less than the three above him (Salah, Aubameyang and Kane). And he is a big-game player, scoring in his last three home games vs. Arsenal. Arsenal concede two goals per game away on average, while Everton could be without a left-back following suspension to Digne and injury to Leighton Baines. Aguero’s involvement in both games either from the start or the bench could be profitable. Few could have anticipated how lethargic Liverpool would be in their 1-1 draw with Leicester. Just three shots on target for the Reds demonstrated the relative comfort Leicester had in protecting their box, but one poor game certainly doesn’t diminish Salah’s captaincy appeal in Gameweek 25. Since Gameweek 16, Salah has failed to register double-figure hauls in just three games. His astonishing 7.5 PPM means he’s still on track to break his FPL season-record of 303 points from last year, and West Ham – who conceded seven goals in four days – won’t be able to help themselves in presenting Salah with chances. In the reverse fixture in Gameweek 1 Liverpool romped to a 4-0 win – with Salah on the score sheet. In fact, Salah has scored four and assisted one in just three games against the East Londoners. Salah doesn’t have the double gameweek appeal, but he doesn’t face any rotation worry unlike the players above him in this list, and with his form and penchant for hurting the Hammers, the Egyptian is well worthy of receiving the Gameweek 25 armband. No one ever said owning Hazard was easy. Much like his club, the Belgian temptress is in poor form. Three league wins in seven has seen the Blues slip out the top four, while Hazard has now gone five games goalless in the league. However, if you’ve persevered owning Hazard during the last five weeks, during which he’s collected just one measly assist, this is the fixture you’ve held on for. Huddersfield travel to Stamford Bridge rock bottom of the league, having won just once away all season, conceding an average of just under two goals per game on the road. The Terriers’ defensive form isn’t terrible: their xGA of 36.95 is the second-best in the bottom half, but Chelsea will be expected to win comfortably. Will they, though? It’s hard to ignore that confidence is emptying from the Blues like the air from the punctured Sarriball, especially after that 4-0 reverse at Bournemouth. While Hazard still hit three shots on target against the Cherries, the second-most behind Josh King (5), all is far from cohesive at Chelsea; with matters made worse by Gonzalo Higuain failing to muster a shot on his league debut. Hazard did, however, create the most key passes (5) in Chelsea’s 4-0 defeat at the Vitality Stadium – he remains creative, and his points per match (6.4) is the third-highest in the league among players with 180+ minutes played. Huddersfield may have a new manager in Jan Siewert, and they performed fairly well in defeat to Everton, but this is as close to a guaranteed home win as you get. If you’re planning Hazard’s exit from GW26, this could be the fixture where he signs off in style. Having made a goalscoring return in Spurs’ comeback win against Watford, the bandwag(S)on is back on the road. And one look at Tottenham’s fixtures is enough to give serious consideration to Son as captaincy material not just for Gameweek 25 but the coming weeks too. Spurs face Newcastle (H), Leicester (H) and Burnley (A) in their next three, and don’t let those teams’ good Gameweek 24 results fool you into thinking the South Korean won’t have his way with them. Prior to GW22, Son scored eight and set up seven in just 11 games. That devastating form has lifted him into the fourth-highest PPM (6.4) among those who’ve played more than 180 minutes. Moreover, while Newcastle’s 32 goals conceded is so-so, their xGA of 38.10 indicates they should have conceded more. And Son’s 20 shots on target makes for one every 58 minutes. The South Korean may be classed as a midfielder, like Salah, but his goal involvement and positioning is far more indicative of a shadow striker. Son’s ownership has shrunk by almost 600,000 since his Gameweek 22 outing against Man United, and is now owned by just 8.6% at the time of writing. If you’re feeling wild, Son is the differential shout this week. Of course, after a physically taxing Asian Cup and reportedly experiencing cramp at full time vs. Watford, stay tuned for Mauricio Pochettino’s press conference in case there’s a suggestion of….you know what. It’s between Aguero and Salah for the Mbappe Boupa Diop boys (please don’t check my team ID I’m trying to make out like I know what I’m doing). Aguero likely gets the nod due to City’s last response to defeat – a 2-1 win over Liverpool. Pep will insist upon a barnstorming performance against Arsenal, and even a prospective cameo against Everton is enough for me to feel confident with the blonde bombshell as skipper this week. 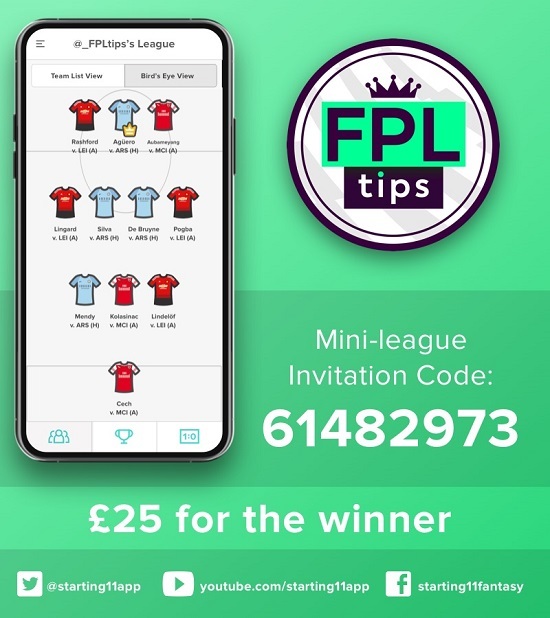 BEFORE YOU GO… We’ll be giving away £25.00 in cash to the winner of FPLTips’ SUNDAY ONLY Mini League on Starting 11 this week.